Elm - a total transformation! I think the greatest satisfaction of renovating a home is when you get to see the end result and compare it to when it first started. 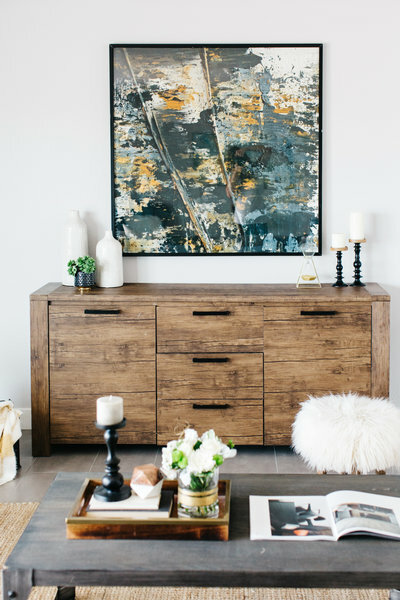 With our Elm project, it was literally a black canvas when we started and I love the finished result! We got the home when it was down to the studs, as you can see below. There was nothing going for this home, except that gorgeous run of back windows. The natural light in this home is AMAZING!! The home is located in a great area of Phoenix and I knew that I wanted to have some fun with the cabinet design, but still keep it classic and clean. Black cabinets in the kitchen was my gut instinct and I am so glad I stuck with it. The combination of the black and white cabinetry paired with the brass hardware and lighting is one of my favorites. It’s so modern and yet I feel like it’s a timeless look too. The living room really comes together with the staging and styling. 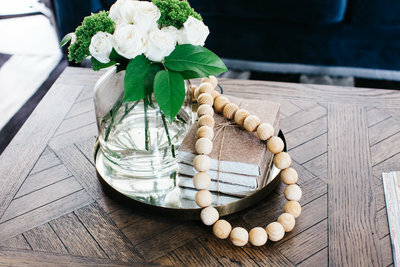 Our plan for that was to keep the main pieces neutral – whites, gray, black & natural materials. 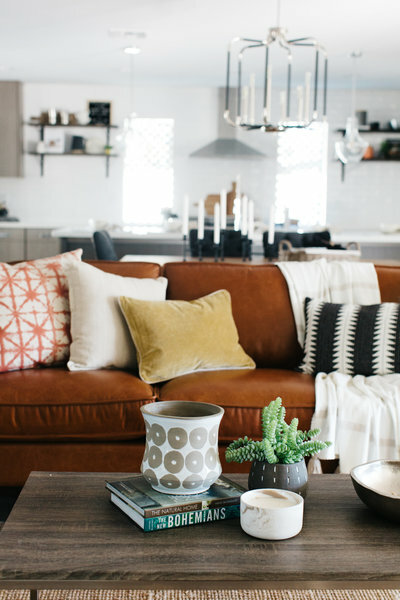 I love, love, love the mixture of all the neutral pillows just packed with texture. The art piece from World Market might be one of my favorite pieces in inventory. I realize the print and colors read more feminine, but I think overall paired with the black cabinetry in the kitchen and the heavy industrial coffee table, it really works well together. One of my favorite moments in the living room might be the baskets on the wall. They make me happy! 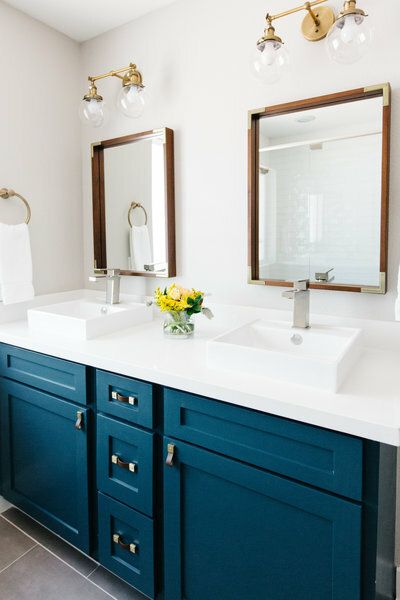 The bathrooms each have their own look and I designed them both with a black, white and taupe scheme and then used different materials to allow them their own design moments. Plus, I wanted to make sure that the master bathroom stood out. A whole wall of shiplap added such a fun accent opposite the shower. 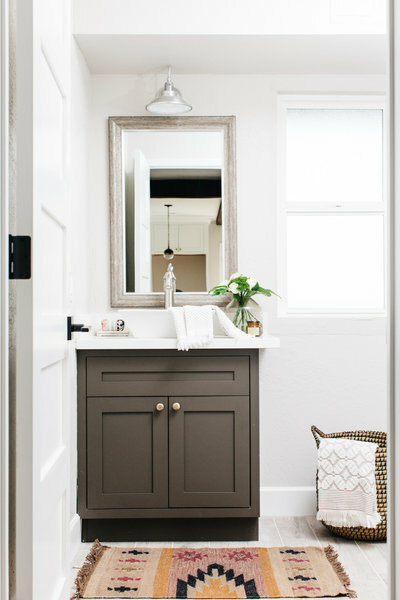 I can’t decide if I like the black vanity or the taupe vanity best. They both turned out great! 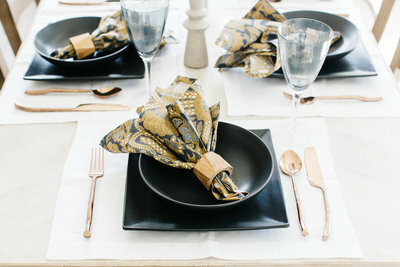 This project was so much fun to design and work on and I am thrilled with how it turned out! You can shop the look below!